JSC "Poltavhim" offers introduction of the newest European technologies (firms "GEMU", "LINNH0FF") and the equipment (firms " DIFFENBACHER ", " BATTENFELD ", " MANNESMAN DEMAG ") in the field of automated galvanic lines, its designing, production, installations up to adjustments and training of the personnel, using modern materials both the own manufacture, and the European manufacturers. Chemically proof polymeric materials allow to refuse in some cases from usage of the titan, lead, stainless steel and other materials. Service life of the equipment from the above-stated materials in some times is more, than corresponding analogues from metals. Technological opportunities of the enterprise allow to make the automated and mechanized galvanic lines of new generation for any kind of coverings. We also carry out assembly and starting-up and adjustment works at the enterprises of the customer with delivery under "key". Galvanic lines are made under the technical project of the customer and can be completed with filtrations and clearing of ventilating emissions, installations of local clearing of drains, with installations of filtration and regeneration of solutions. 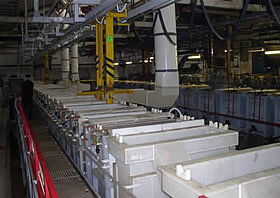 Manufacturing separate elements of galvanic lines - baths, onboard aspirator, air lines, drums, etc. is possible. We have real opportunities of production of other kinds of the equipment, technological adaptations and equipments under technical orders of consumers. Chemically proof equipment from polymeric materials has well recommended itself at the enterprises of many branches of a national economy. The basic units of lines - baths of chemical and electrochemical coverings, capacities, distributing of pipelines and stop valve - are delivered from polypropylene, that provides reliability, durability, fine corrosion resistance and an excellent aesthetic look of products. The equipment is delivered complete with rectifier units, a modern control system of auto operators on the basis of industrial programmers of domestic and import manufacture, can be equipped with modular air lines. mechanized auto operational a drum suspension lines of galvanic coverings with a control system "from the button on operation". 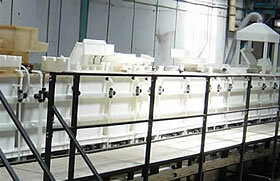 Lines of galvanic coverings on request of the customer can be completed with local systems of sewage treatment.